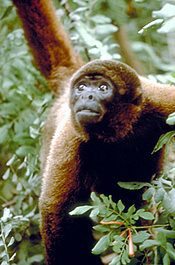 The yellow-tailed woolly monkey is a rare species found in the mountainous area of northern Peru. It was thought to be extinct until a small population was rediscovered in 1974. Its fur is reddish-brown and very long and thick. As its name suggests, the fur of its tail is yellow in color. The tail is also long and powerful which the woolly monkey uses as a fifth arm to travel through the forest and to position itself while feeding. The average weight for males is 18.3 lb and for females 12.5 lb. They are known to leap long distances of over 15 meters from tree to tree. Yellow-tailed woolly monkeys are found in montane cloud rainforests at an elevations of 1700 meters or higher. Their forest habitat usually contains steep gorges and ravines, fog, and trees up to 40 meters high. Diet consists mainly of fruits, but they will also eat leaves, flowers, and buds. They prefer to remain high up in the trees and are only active during the day. They are very social and are usually found in groups of 4 to 14 individuals with one to three of them being males. 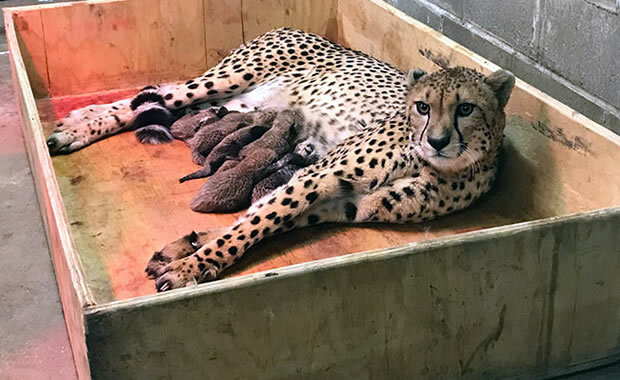 Females may mate with any of the males and give birth to only one young after a gestation period of 223 days. In 1999, the remaining population was estimated at 250 individuals, and this species was classified as one of the top 25 most endangered primates in the world. This species has a very low reproductive rate and some are caught and sold in the pet trade. Other threats include hunting and loss of habitat due to construction of new roads, agriculture, logging, and cattle ranching. Some monkeys are bred in captivity and one population is said to be preserved and protected in the Rio Abiseo National Park. Copyright Notice: This article is licensed under the GNU Free Documentation License. It uses material from the Wikipedia article "Yellow-tailed woolly monkey". Glenn, C. R. 2006. "Earth's Endangered Creatures - Yellow-tailed Woolly Monkey Facts" (Online). Accessed 4/21/2019 at http://earthsendangered.com/profile.asp?sp=288&ID=11. Need more Yellow-tailed Woolly Monkey facts?